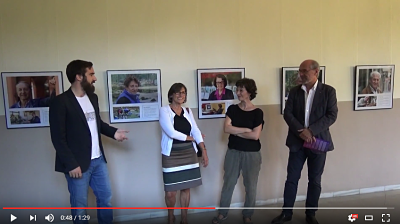 The photography exhibition “A full life” by photographer Ana Portnoy continues its tour. After being exhibited for the first time in the Espai “LaCaixa” Sagrada Família, and after that in Donostia until the 15th of September, past Monday 19th of September it was inaugurated at the University of Lleida. The event counted on the participation of Ander Errasti (project manager of the SIforAGE Project), Nuria Casado (head researcher of Group Dedal-Lit at the UdL, and member of SIforAGE), Joan Biscarri (vice rector of cultural activities and university projection), and the author herself Ana Portnoy. The opening act gathered dozens of attendants who were interested on the exhibition, the Project and/or the SIforAGE International Conference 2016. “A full life” continues its path and will be at the University of Lleida until the 7th of October, just in time to be at the University of Barcelona on the 10th of October to welcome the Conference Day 1 and Day 2 which will take place there on the 19th and 20th of October. For now, as the last programmed exhibition, it will be in the Cultural Center CaixaForum during the End-of-Project Symposium on the 21st of October. Do not miss the chance to visit this unprecedented and unique exhibition which perfectly transmits the reality of Active and Healthy Ageing. You can watch below a glimpse of what happened during the inauguration.